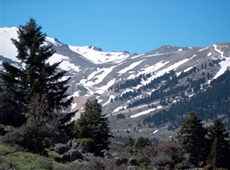 The ski resort of Kalavrita is situated 15 km off the town of Kalavrita, at NW of Mountain Chelmos and at an altitude of 1700 meters (Xerokampos), to 2340 meters (Neraidorachi). It offers modern facilities, 8 lifts and 13 slaloms of all categories. Set up for the first time in 1988, the ski resort of Kalavrita gave strong impetus to the tourism development of the region. During the winter season (December to April) it is open daily from 8:30 to 16:00. On its premises there are garages, cafeteria, restaurants, shop selling and hiring ski equipment, as well as photographic equipment and a First Aid Station. Finally Ski Resort of Kalavrita is suitable for expert or novice skier, as courses can easily be arranged. The gravel road begins at the village Metochi, near Vlasia; when you see a wooden sign that says "To Rodea" turn right. The road is quite wide. Initially it goes through low hills but afterwards it crosses a wonderful fir forest. Rodea is a children's camp and at the only crossing that you will meet, follow the right (to the South) gravel road; the other road leads to village Manesi. Through fine fir forest and just 10 Km from the previous crossing, you will enter the first houses of the graphic village Kouteli. The gravel road starts from the last houses of village Ano Vlasia. It crosses landscapes with a lovely view beside the water sources in Soulinari, through streams and torrents with smooth rocks, and through the fir forest. 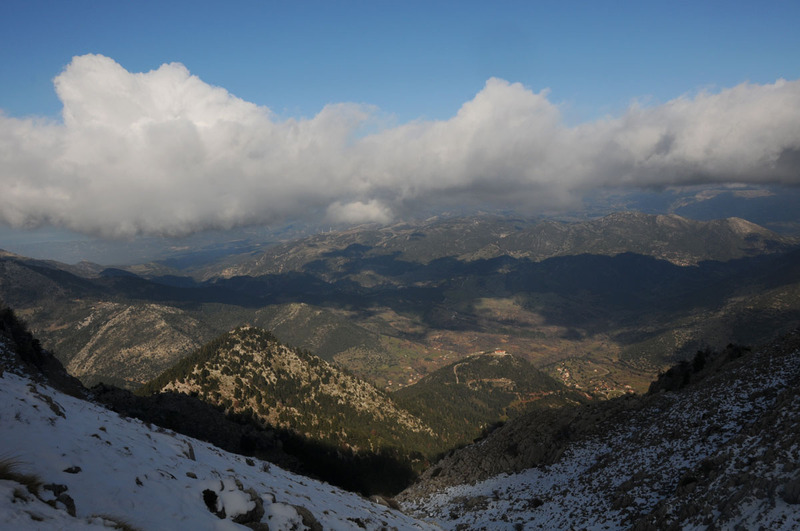 At an altitude of 1450 m the road goes downhill to the village Lechouri, which is situated 16 Km off Ano Vlasia. As you drive from Patras to Kalavrita trough Chalandritsa, turn left following the signs, at village Flampoura. You will pass through village Neochori and the Selinountas' valley, where the view is truly beautiful. About 3 km after Neochori you will find a sign leading to the Monastery; all you have to do is drive for about 10 km enjoy the road that crosses through a magnificent forest mainly consisting of oaks and beech. The Monastery of Makelaria is built on top of a stiff cliff at a very peaceful and beautiful location. The surrounding area can be reached by a 4x4 car or an enduro bike; it is full of gravel roads that lead to villages Lapanagi, Rakita, Petsaki, and the roads are next to Selinountas River banks. Caution : The following routes are suitable for people with mountaineering experience and knowledge of orientation in mountainous area. The path, suitable for trekking is near Ano Vlasia. Unfortunately there are no signs, so best is to seek directions for a short gravel road south of the village, which leads to a water source. Behind the water source is a mysterious and dark cave. Those who have partly explore it mention the existence of underground lakes and extraordinary landscapes. Suitable equipment and caution is advised, as the surface is wet and mouldy. Going downhill to the edge of the river you will find the waterfall of Saint Taxiarchis. 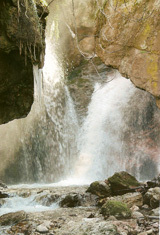 The scene is magnificent; Water sources comes from various directions on rush falls into a dark lake, in order to join Selinountas river. The path starts from Metochi near Vlasia and ends at the top of Kalifoni mount. It' s a difficult path. Expirience in trekking and mountaineering is necessary. The path starts near Ano Vlasia on the road that links Vlasia with Lechouri and ends at a top of Mt. Erimanthos called Skouteli. 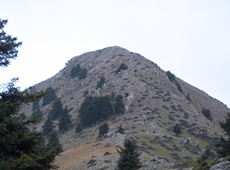 The path starts at Ski Center of Kalavrita and ends at the Monastery of Mega Spileo. The path starts from Kalavrita and ends at Diakofto passing through the beautiful Canyon of Vouraikos, next to famous cog railway of Ododotos. It is a part of Ε4 international path. The landscapes are wonderful. At a short distance from Kalavrita you will meet the village Kato Zachlorou, where you can have a break for coffee, food and relaxing. The path begins from the village Peristera or Solos, which is located at an altitude of 1000 meters, near the Tsivlou lake. Initially, we follow the forest road that passes through pines and continue to the path that leads to waterfall of Styx's Water. Caution is advised as the path is quite steep. Caution : The above routes are suitable for people with mountaineering experience and knowledge of orientation in mountainous area.